This year is the 10th anniversary of the Pet Food Drive campaign, which has helped ensure our furry, four-legged friends in pet shelters all over Singapore to never go a day without food. 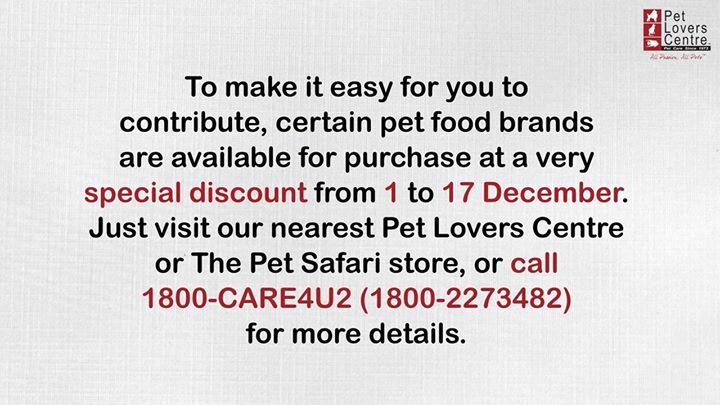 If you'd like to contribute, certain pet food brands are available for purchase at a very special discount from 1 to 17 December. Just visit our nearest Pet Lovers Centre or The Pet Safari store, or call 1800-CARE4U2 (1800-2273482) for more details. Previous: [The Manhattan FISH MARKET Singapore] Enjoy a rewarding start to your career when you join our family of sea-cret agents!